Guinea pigs are highly social animals and are best kept in groups of at least 2 piggies. Pick active, inquisitive guinea pigs that are roaming around their enclosure. The eyes of the guinea pigs should be clear and free of discharge, and the coat should be smooth and shiny. Pay attention to the droppings in the enclosure- avoid buying guinea pigs from a pen with watery droppings. Ideally, guinea pigs should be housed in groups of the same gender and of similar size/age. 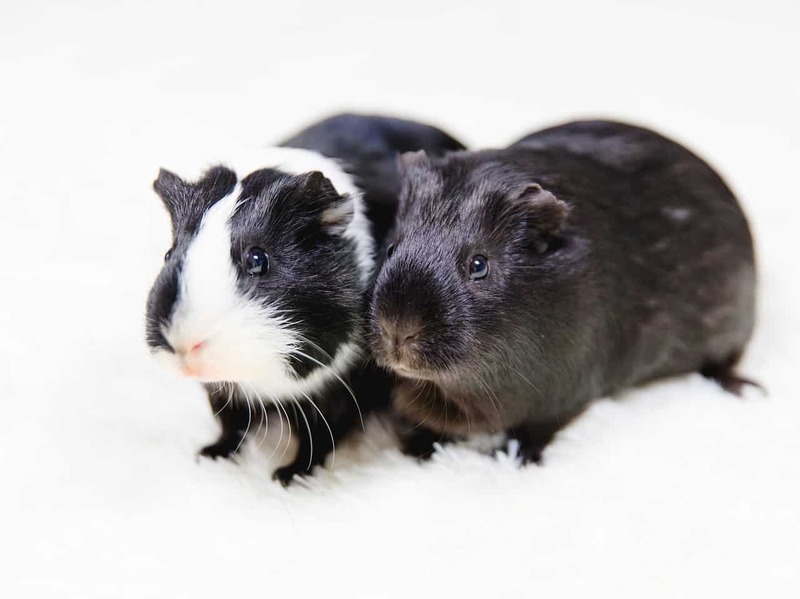 Female guinea pigs get along very well at all ages, but males should be introduced to each other from a young age and raised together or fighting may result. Large variations in size of guinea pigs may lead to the smaller guinea pig being picked on. Entire male and female guinea pigs should not be housed together unless you are planning on breeding from them. Guinea pigs are prolific breeders. Female guinea pigs MUST be bred before 8 months of age, or not at all. This is because after 8 months the pelvic bones fuse resulting in difficult or impossible birthing of the pups. Are Guinea pigs good pets for children? Guinea pigs are suitable for children over the age of 10 years. Guinea pigs are docile, friendly and inquisitive animals. They are unlikely to bite or scratch. Because of their friendly natures, guinea pigs may not resist when a young child is too rough. Guinea pigs are also fearful of loud noises and unpredictable movements, which makes them unsuitable for young children. Before purchasing a guinea pig for your child ensure he/she understands how to care for and handle a guinea pig appropriately. Remember that guinea pigs can live for 3-7 years, children may lose interest in this time and parents should ultimately be responsible for the care of the guinea pigs throughout their lifetime. In the wild guinea pigs roam in long grass and along tracks on the side of hills. Guinea pigs are frightened of wide open spaces and feel safest when they have places to hide. The minimum size of a guinea pig hutch is 1m x 0.7m X 0.7m and should contain both sheltered and exposed areas. Double the size enclosure is needed for 2 guinea pigs. Cardboard boxes and PCV pipe tunnels can be provided for your guinea pig to play and hide in. Avoid chicken wire floors of enclosures as they can damage the soft pads of your guinea pigs’ feet. Guinea pigs can be housed indoors or outdoors. Care should always be taken to ensure outdoor guinea pigs do not get too hot as they are prone to heat stress. In summer guinea pigs should always be housed in the shade. Providing frozen ice packs wrapped in a towel can give your guinea pig a cool place to rest on hot days. The most suitable bedding for guinea pigs is grass hay (such as timothy hay) and untreated wood shavings. Sawdust should be avoided as it can cause eye irritation. Fresh hay should be added daily and underlying wood shavings should be changed at least once a week. A lot of clients ask us what to feed guinea pigs. The bulk of your guinea pigs diet should be made up of fresh grass or grass hay (such as timothy hay). Grass should be available all the time for your guinea pig. The rest of the diet can be supplemented with daily fresh fruit and vegetables. All guinea pig diets must contain vitamin C. Both humans and guinea pigs are the only animals that cannot make their own vitamin C, therefore they must gain this from their diet. The best way to provide vitamin C for your guinea pigs is to give them fresh dark leafy green vegetables and fruit daily. Pelleted diets or water supplements claiming to be enriched in vitamin C are unreliable. Pelleted feeds can be given in small quantities but should not make up the majority of your guinea pigs diet. Look for grass-based pellets with a fibre content of at least 16%. 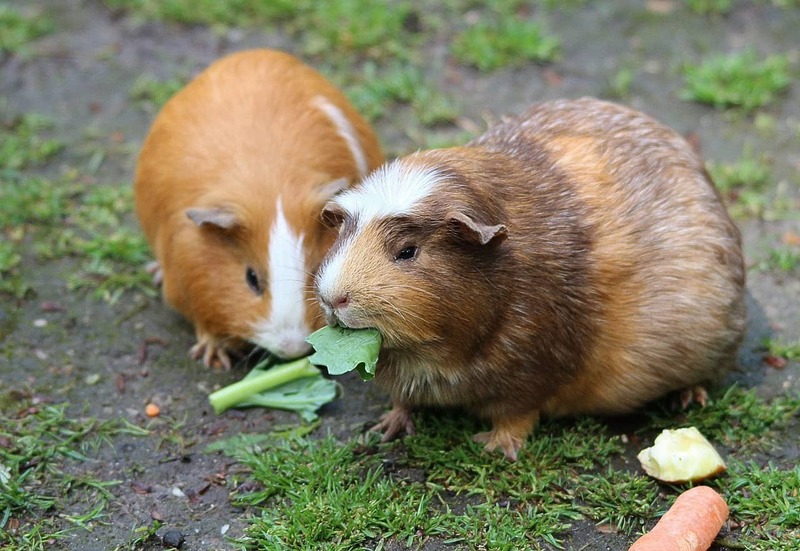 Guinea pigs are prone to obesity. Seed-based diets, particularly those including fatty sunflower seeds, should be avoided. Unfortunately, many commercial guinea pig diets are unsuitable as sole or primary diet, these should be provided as occasional treats only. Guinea pigs have continuously growing cheek teeth and incisors. Provide your guinea pig with plenty of hay and chew toys to avoid future dental disease. Water should be provided for guinea pigs at all times. Fill your guinea pigs water bottle daily and check that it flows out the bottom. Guinea pigs are prone to spitting food up their water bottles- which can block and lead to dehydration. Guinea pigs are highly intelligent and inquisitive animals. Daily exercise is important for your guinea pigs’ physical and mental health. Many conventional enclosures are too small for guinea pigs to exercise adequately, and for you to interact with them. A children’s play pen with shade cloth netting around the base to prevent escape can be an excellent exercise enclosure. Place cardboard boxes and PCV pipes in the pen for your guinea pig to hide in. Do not leave your guinea pigs in the pen outside unsupervised or overnight as they may fall victim to predators such as foxes. Guinea pigs are prey animals. In the wild a sick guinea pig is the first to be picked off by predators. As a result, guinea pigs will hide illness and may not display clinical signs until they are very very sick. It is important to interact with your guinea pig daily to get used to their normal behaviour. If you suspect your guinea pig is unwell seek immediate veterinary attention- signs of illness are subtle and waiting may prove fatal for your guinea pig. At Southern Cross vet, we are an ideal choice for your guinea pig vet Sydney via our Inner West or Eastern Suburbs Vet Clinics. Call us today or book an appointment online.